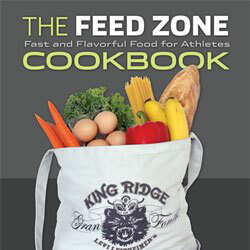 The Feed Zone Cookbook by Chef Biju and Dr. Lim deserves a place on the kitchen shelf in any endurance athletes kitchen. It’s packed with quick, easy and nutritious recipes to fuel you before you train and during the critical post exercise recovery phase. The Feed Zone Cookbook also features excellent recipes for portables that you can take with you on the bike to help fuel your ride naturally and improve the fitness gains from your training session. The Feed Zone Cookbook was created from hard won race proven experience that Chef Biju and Dr. Lim earned on the Pro Cycling Tour at races such as the Tour de France. Get your copy today and start fueling your ride the natural way.